Today is the 600th anniversary of the Battle of Agincourt. It got very little coverage, given that it was one of the biggest victories in English history, you’d think it would have been plastered all over the newspapers for weeks. We thrashed the French for God’s sake, despite the fact that their army was 4 times bigger than ours. Apparently it was all down to the fact that we had the longbow and the French just fought with little ones or baguettes or something. But of course the bowmen didn’t get the credit, we all know who won at Agincourt. It was Larry Olivier ” Once more into the breach, dear friends… Cry God for Harry, England and St George” and all that. Or was it Kenneth Branagh ” On this day “. Well never mind, it was definitely Henry V. But which Henry V ? For Capricorn Research the first port of call for chart data of famous people is Wikipedia which has Henry as being born on August 9th 1387, which when adjusted for the Gregorian calendar comes to August 17th. All reports of Henry V was that he was a proper king, so what better than a stellium in Leo. The Sun conjunct Mars looks just the job for a warrior monarch who led his troops from the front. Also perfect for stirring speeches is the Sun sextile the Moon in Gemini. Just to bestow even more power, his Sun and Mars is square to Pluto. And for intuitive leadership and strategic skill, the Sun and Mars sextile Uranus would come in handy as well. In fact the noon chart looks so perfect on its own that I was tempted to leave it at that, but just in case there was one, I looked on the astrodatabank for a timed chart. The time given was 11.25 am which would keep everything pretty much as it is although Mars comes into the 10th house, sounding even better. There was just one problem. The astrodatabank chart gave a birthdate of 16th September 1386 ( 24th after calendar adjustment ). Now this is a very different kind of character. Sun and Venus in Libra, Moon Cancer, suggests a gentle aesthetic soul who would much rather stay at home than be rampaging around the battlefields of northern France. Granted the Moon is widely opposite to Mars ( in Capricorn ) but thats nothing compared to the Sun / Mars / Pluto character of Henry V part 1. Capricorn Research exists largely to follow up these kind of conundrums, even if its just so that noone else has to. And after extensive forays I can reveal that its all the fault of a French astrologer of the day. The date of 16 September 1386 comes from a horoscope apparently commissioned by Henry just before the Agincourt campaign. Quite why the English king would employ a Frenchman to draw this chart just as he was about to invade that country is an interesting question. First of all we have to make the assumption that the only reason a monarch of the Middle Ages would want a horoscope to be drawn just before a battle would be that said chart would show that he would definitely win as he obviously had God on his side. A natural extension of this would be that Henry told his astrologer to just come up with any old date to ensure that he would win at Agincourt. Its quite possible that Henry deliberately chose a Frenchman to draw the chart because word would get back to Charles VI of France that the invasion was destined to succeed. We would also have to assume that any astrologer elected to draw said chart, would be extremely keen to fulfil this criterion, particularly if he wanted to maintain any kind of relationship between his head and his body. This would surely be the case even if or especially as he came from the land of Henry’s enemy. In that case, why would the astrologer come up with a chart that made Henry look such a Libra / Cancer wuss ? Well perhaps a bit of background is helpful. 600 years ago, astrologers were not obsessed with the zodiac signs as significators of personality as they are these days. In fact people weren’t that interested in what we call personality at all. They were only interested in what was going to happen, winners or losers, survivors or victims. Hardly anyone knew or cared what year they were born in never mind what their Sun sign was. Only monarchs or high born people had their births recorded. And no one in their right mind was going to hand a Jungian personality analysis to Henry V, not if they wanted to keep their right mind anyway. So it didn’t matter what signs Henry had stuff in, the only thing that mattered was transits to his Mars for beating the French. Another important factor to take into consideration was that Uranus, Neptune and Pluto had not been discovered. Capricorn Research’s experience is that these planets always had an effect even hundreds of years before they had been discovered. After all astrology works, despite the vast majority of people being completely ignorant of it. So all this does really simplify things for said French astrologer. Basically Jupiter means winning and Saturn means losing, so he had to come up with a birth date for Henry that would place Jupiter with his natal Mars at the time of the battle. Jupiter was at 12 degrees 34 Capricorn on the morning of the battle. So the astrologer would have to come up with a birthdate that would give Henry’s Mars at 13 Capricorn. Hence 16th September 1386, see above. The Libra / Cancer chart seems such a poor fit for Henry, it seems likely that this birthdate was simply invented by the astrologer for the king’s benefit. 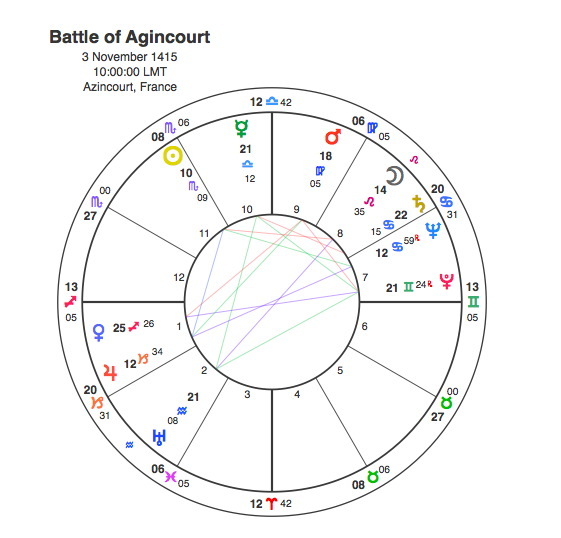 However you would expect the chart for the Battle of Agincourt to resonate strongly with Henry’s real chart, particularly his Mars. The standout feature of the Agincourt chart is an exact Grand Trine at 21 degrees of the Air signs between Mercury, Uranus and Pluto. The winner of this battle would surely connect with this pattern. Henry V Part One, the Leo version has Mars at 21 Leo forming an incredibly tight and auspicious Kite formation to this Grand Trine and Henry’s Uranus at 21 Libra is right in the middle of it. So at the time of the battle of Agincourt, Pluto is sextile and Uranus is opposite Henry’s Mars, perfect for such a valiant, unexpected victory, against overwhelming odds. Its very appropriate that Shakespeare’s version of history places such importance on Henry’s power of oratory and the way he inspired his men. With Mercury at the top of that Grand Trine, his pre battle speech meant he really couldn’t lose. In fact if we look at the main points in Henry’s life, they fit very closely with major transits to the Leo chart. Jupiter is natally in the 10th house in very close sextile to the noon chart Ascendant. When Henry was crowned in 1413, Jupiter was conjunct his Ascendant. But as followers of these articles will know, its Pluto’s transits that really do the business even over 500 years before it was discovered. As we have seen Pluto was sextile Henry’s Mars for the Battle of Agincourt. Agincourt was the single fight that everyone is aware of, but the campaign in France continued until 1420 when Henry’s forces reached Paris. In June 1420 the Treaty of Troyes was signed recognising Henry V as regent and heir-apparent to the French throne, and he was subsequently married to Charles’s daughter, Catherine of Valois. In 1420 Pluto was sextile Henry’s Sun. Henry died two years later in 1422 with Pluto conjunct his 8th house Moon. The case for the chart of Henry V part 1 rests in the certainty of it being the correct one. Arguably the most famous astrologer of all time was a Medieval Frenchman, Michel de Nostradamus. The one in this story is unknown, but maybe his probably invented chart had its part to play. Perhaps the French army were so scared of Henry’s imaginary Jupiter / Mars transit that they froze on the day. Or maybe they were complacent because they thought they were up against a Libra / Cancer. We shall probably never know.